1.What is the difference between D-Link D-ViewCam and the traditional surveillance system? D-Link D-ViewCam records video in MJPEG and MPEG4 formats, stores high quality image data on computer hard disks, and provides easy query and review of the stored video. Traditional surveillance systems use videotape for storage and review, which is hard to managed, time consuming and the recorded video will degrade over a period of time or usage. 2.What is the Lux Factor for my Internet camera? Lux is a unit of illumination equal to one candle intensity or equal to one lumen per square meter. Note: Lower LUX value cameras work better in low light. 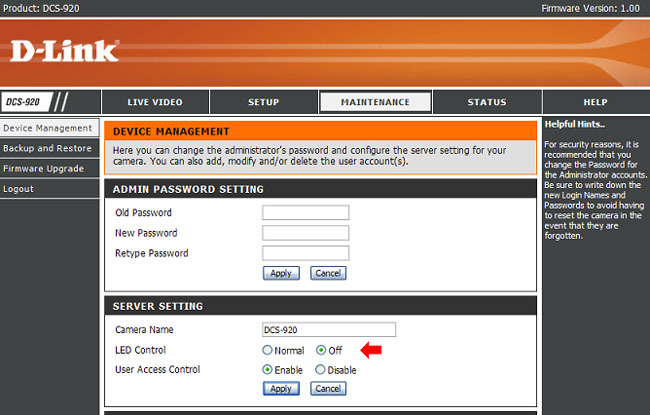 3.How do I turn off the LED indicator on my DCS-920/910 series camera? Step 2: Click the Maintenance tab and then click Device Management to the left. Step 3: Click Off using the radio buttons next to LED Control. Step 4: Click Apply to save the settings. 4.How are multiple camera views displayed on the screen using D-ViewCam 2.0? If you deploy several cameras and they are all displaying video at the same time, you have several options to arrange the display of these videos on your computer screen. One option is to reserve a major part of the screen to display the video from a single camera. Another option is to split the screen to show videos from multiple cameras. To switch the display from one camera to another, you can either manually select a camera, or have the system automatically display videos from all cameras in turn, called auto rotation. 5.What is the field of vision of my D-Link DCS camera?